This is your second week getting tomatoes. Last week we put the partial share tomatoes in plastic clam shells and the full shares in paper quarts hoping they wouldn’t roll around in the boxes too much. This week and going forward your tomatoes will be in a brown paper bag. PLEASE be careful not to smush your tomatoes when unloading them out of your box. We take extreme care during harvest, post harvest, packing, and moving boxes to keep the tomatoes from bruising. Avoid putting your brown paper bag of tomatoes at the bottom of your bag when unloading your share (insert sad trombone). Right now we are at the peak of the season, which may not seem like the best time to be planning for next year. But we have found it is absolutely the best time to be planning for next year! Because right now all of our successes and mistakes (or should we call those learning opportunities) are right under our noses and under our feet and all around us. We are keeping a notebook with ideas for next year and there is no better time to capture that than right in the thick of the season. One thing we keep coming back to over and over this year is, My Goodness, we love our CSA and it’s you are our favorites for growing produce! 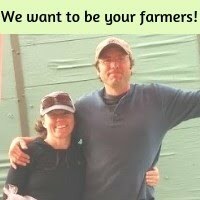 We hope you are enjoying the CSA box each week! Carrots - are you loving how many carrots are in the shares this year? We sure are loving including them in the boxes so many time this year! Just a reminder to keep them in a plastic bag or glass container in the fridge so they don’t dry out. Medley of Golden, Chioggio, and Red Beets-we love roasting these all together for a beet rainbow. Zucchini or Patty Pan Squash-hope you aren’t getting tired of zucchini! We like to saute it as a side dish but if you aren’t a huge zucchini fan you can try the zucchini pizza crust recipe below! Cucumber-these are one of our kids favorites and this time of year sometimes they are tired of ‘lettuce salad’ but they never seem to get tired of a plate of peeled, sliced, cold cucumbers. Rainbow Chard-this small stemmed rainbow chard is just delicious. Chard can be used interchangably with cooked spinach in any recipe. Green Bells/Purple Bells-the first bells of the year will be the perfect topper to a fancy salad this week. Fresh Shallots we love the flavor of shallots; somehow both mild and distinctive. Use just as you use onions. These are fresh and uncured. Keep them in the pantry or the fridge and use ‘em up in the coming weeks. Tomatoes-Are you loving your CSA tomatoes? Just remember they do not need to go in the fridge. Potatoes-we dig potatoes every week and sell as we go. Fresh and dug this week! Soooooo good! This week, we were so excited to welcome Anna McCabe, owner and chef of Simple Chef Catering in Bigfork, into our kitchen to film another episode of our 'cooking with a CSA share' videos. The two recipes here are from that video. We hope you enjoy them, and many thanks to Anna! Check out the video below! Mix beets, shallot, bread crumbs, rice, salt, pepper, mustard, eggs, parsley and walnuts together in a bowl. Form the mixture into a patty. Heat the oil in a skillet and pan fry the patty for around 5 minutes on each side. De-stem the chard and lay it out on a serving platter. Place the cooked patty on the chard. Top with ½ tablespoon goat cheese.